Alexandre Lacazette has stylishly taken a dig at England football fans by claiming that they are not as supportive as those in his country. The striker became an Arsenal player through a £50million transfer in the summer of 2017 and even as he did not click immediately into the league, he has now become a favourite with his form so far this season. It was quite unfortunate that at a time when he was still on the verge of putting himself together, Pierre-Emerick Aubameyang arrived and reduced his chances of being a regular. Good enough, he has become better under Unai Emery, scoring four in the ongoing campaign and establishing a stunning patnership with Auba who is supposed to be a rival. 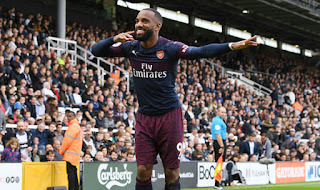 Despite the love he has earned in the hearts of Gunners faithfuls, he may as well have angered them a bit with his comments during an interview with French outlet, Le Progres. "I miss Ligue 1's atmosphere," the former Lyon star said. "In England, the fans are more spectators than supporters. "There's a better atmosphere in French stadiums." It won't be so difficult for fans to overlook his remarks as he is doing his job as expected on the pitch. His four goals, two of which came in the most recent game against Fulham, have helped take the club to fourth position on the Premier League table. Laca got fans talking on Twitter in the course of the international break when he made some incredible finishes while in training with his teammates at London Colney.